Re-Tune & Re-Vitalize Yourself With Nature! Watching the glorious rising sun, the magnificent sunset... Witnessing a rainbow, a double rainbow... Witnessing dolphins at play... Or simply just being... .
We offer a peaceful and supportive environment in a spacious and serene setting, nestled on an old coral reef in Negril, Jamaica. At Jackie's, the Carribean Sea lullabys you to sleep, while the trade Winds keep you cool. The infinite splendor of nature keeps you in awe. The cottage, a cozy temple of rest, has a double bed and private bathroom, or... You can stay in one of four spacious chambers in the magnificent stone house, with private bathrooms and furnished with two 3/4 size handmade dogwood tree beds. In each chamber, the floors are hand painted by friends to create a unique atmosphere. 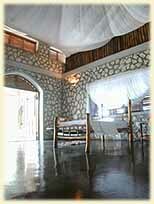 Each chamber is tastefully and simply decorated for your serenity and comfort. Jackie's On The Reef is located 7 miles from the center of town on a gorgeous, secluded coral reef two miles past the oldest lighthouse in Jamaica. and a moment to appreciate the beauty of life.